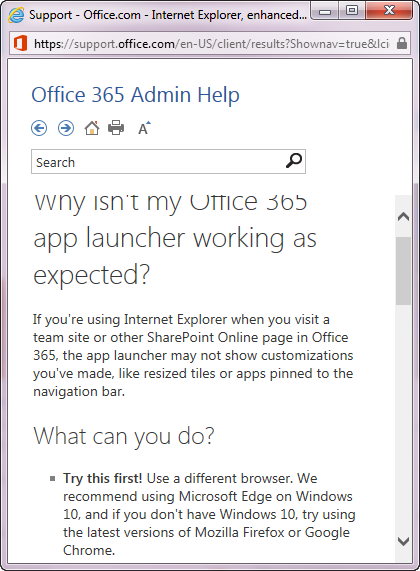 Why isn't my Office 365 app launcher working as expected? If you're using Internet Explorer when you visit a team site or other SharePoint Online page in Office 365, the app launcher may not show customizations you've made, like resized tiles or apps pinned to the navigation bar. ## Try this first! Use a different browser. We recommend using Microsoft Edge on Windows 10, and if you don't have Windows 10, try using the latest versions of Mozilla Firefox or Google Chrome. Everyone has been hacking on IE forever, but to see this level of openness from Microsoft itself is quite telling. Yes, they're promoting Microsoft Edge, but nothing wrong with that. There was a time when people at MS were saying silly things like "don't call it a bug, it's an unintended feature." I was at an event when Steve Ballmer called out that behaviour and told the audience to be open with customers. "If it's a bug, call it a bug." That was around 2002. It's good to see the openness continues.